San Diego, CA, USA – Arriving at the University of California San Diego’s RIMAC Field Arena in the warm West Coast sunshine, His Holiness the Dalai Lama was welcomed by UCSD Chancellor Pradeep Khosla. Reputed television journalist Ann Curry then escorted him into a meeting with members of the media. She introduced him and asked if he would like to give his own preamble. “Wherever I go,” His Holiness began, “I feel I’m one of you, one of the 7 billion human beings alive today. We are physically, mentally and emotionally the same. From birth, we all want to live a happy life and that is our right. However, many of my friends share the view that our existing education systems are inadequate when it comes to preparing people to be more compassionate—one of the conditions for being happy. As a human brother I’m committed to letting people know that we all possess the seeds of love and compassion. However, having a smart brain is not enough; we also need a warm heart. “My second commitment as a Buddhist monk, and as someone who has lived 58 years in India, is to promoting the harmony and friendship among religious traditions that I have observed flourishing in that country. Thirdly, as a Tibetan, and someone in whom the majority of Tibetans have placed their trust, I am committed to preserving Tibet’s non-violent culture. This includes the ancient Indian knowledge of the workings of the mind and emotions that we have preserved for more than 1000 years, but which remains acutely relevant today. In addition, since more than 1 billion human beings across Asia depend on the waters of rivers that rise on the Tibetan plateau, I am dedicated to protecting Tibet’s natural environment. Responding to a question about the environment, His Holiness stated that climate change and environmental protection are global issues that need to be addressed with vision. He reminded his listeners that the USA is part of the wider world. Asked how to transform personal pain into something useful, His Holiness remarked that it is not a matter of just taking a pill. Mental training takes years of effort and involves learning how to tackle our negative emotions. On an individual, community and global level warm-heartedness is essential. He cited Tibetan monks he knows who were imprisoned for decades in Chinese jails who say the greatest danger they faced was losing compassion for those who incarcerated them. He mentioned the insight of cognitive therapist Aaron Beck that 90% of our anger is mental projection. Finally, journalists sought His Holiness’s response to some Chinese students raising objections to his visit to the University. Taking the stage on the RIMAC Field outside UCSD Chancellor Pradeep Khosla introduced His Holiness to the crowd of 25,000 sitting patiently in the sun. He said, “His Holiness inspires us to develop compassion and gain an understanding of ourselves and our world.” He was followed by Mayor Kevin Faulconer, who exclaimed, “What a great day, what an honour to be able to listen to one of the world’s greatest advocates for peace speak about diversity here in San Diego, where people from all over the world have made their home.” As His Holiness came onto the stage, Mayor Faulconer presented him with a key to the city, which His Holiness held up for all to see. Before inviting him to speak, Ann Curry introduced His Holiness to the crowd as someone who is not only convinced that findings that basic human nature is compassionate are a sign of hope, but is also someone who reaches out to others with a message of compassion and non-violence. “I don’t like formality,” he went on. “There’s no formality when we’re born and none when we die. In between we should treat each other as brothers and sisters because we all want to live a happy life. This is our common purpose and our right. Nothing is guaranteed about the future, but we live in hope of being happy. At the same time we face all sorts of problems, many of them of our own making. Why? Because we are swayed by emotions like anger and fear. However, I believe we can learn to tackle such emotions. And one of the most effective remedies for dealing with destructive emotions is to cultivate loving-kindness on the basis of the oneness of all 7 billion human beings. This is why I address you as brothers and sisters. “If we understand that we are all the same, there are no barriers between us. So, I deliberately try to promote compassion on the basis of the oneness of humanity. “In human history different communities came about in different places, in different environments, at different times. Different languages and modes of writing arose. The result of this natural diversity is that humanity is like a garden filled not with a single bloom, but with an array of different kinds of flowers. However, when we over-emphasize secondary differences of race, colour, nationality, faith, whether we are rich or poor, educated or uneducated, we forget that we are all human beings. While preserving our own culture and identity we need to remember that we are one in being human, that challenges like climate change affect us all, and focus on warm-heartedness. The first of several questions from the audience read out by Ann Curry came from a 93 year old woman whose granddaughter will graduate tomorrow. She wanted to know what advice His Holiness had for her about making the world a better place. In his reply he suggested that in the 20th century the inclination had been to try to solve problems through a use of force. He said this had been a mistake and that if we are to make the 21st century a period of peace, we need instead to resolve problems through dialogue. He pointed out that taking a divisive attitude, using harsh words, for example, is a reflection of narrow-mindedness. To be happy and joyful we need friends. Friendship is based on trust and trust depends on our treating others with kindness. Asked who he most admires, His Holiness mentioned Mahatma Gandhi, Martin Luther King Jr. and, of those alive today, Bishop Desmond Tutu. As to what he has learned in this life, His Holiness was clear that he first learned about love and affection from his mother. But he added that after becoming a refugee in 1959 he has had so many opportunities to meet and get to know so many different kinds of people, scientists in particular. As a result he now considers himself half a Buddhist monk and half a scientist. He stressed that since the tragedy that took place in Tibet brought about other opportunities for him, he had learned that nothing is absolutely negative. His Holiness concluded that things do not happen as a result of miracles, but by making an effort and exerting inner strength with determination and self-confidence. He thanked the audience for listening to him, asking them to reflect on what he had said, particularly that what the future holds depends on what actions we take now. Invited after lunch to interact with friends and supporters of the University of California San Diego at the Chancellor’s residence, Geisel House, he was introduced to the 130 people gathered there by former speaker of the California legislature, John Perez. His Holiness began by summarizing again his three commitments to promoting human values as a source of happiness, to encouraging inter-religious friendship and harmony and to preserving not only Tibet’s knowledge and culture, but its natural environment as well. He observed that Tibetans have kept alive ancient Indian knowledge, particularly about the workings of the mind and emotions for more than 1000 years. Asked what he eats, His Holiness explained that the traditional custom for Buddhist monks is to gather alms. He mentioned having joined monks doing this in Thailand. The consequence is having to accept whatever you are given without expressing a preference for this or that. Answering a neuroscientist’s enquiry about how to encourage children to sustain mindfulness, His Holiness advised that the practice of cultivating single-pointedness or ‘shamatha’ has the effect of improving memory, while the analytical approach of ‘vipashyana’, or special insight meditation, sharpens the mind. 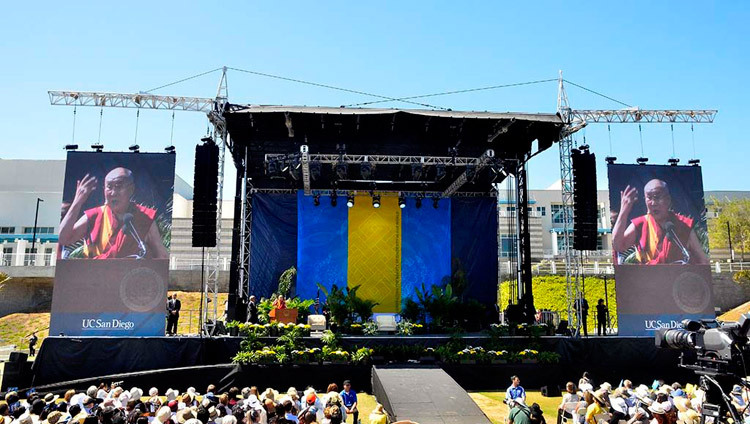 Tomorrow, back on the RIMAC Field, His Holiness will give the University of California San Diego Commencement address.